Successfully Added NO.1 F2 Outdoor Bluetooth Watch - App Support, Pedometer, Altimeter, Thermometer, Stopwatch, Call Reminder, IP68 (Blue) to your Shopping Cart. The NO.1 F2 Bluetooth smart watch is the ultimate outdoor gadget that is sure to put a smile on the face of all sport and fitness enthusiasts out there. With its highly accurate pedometer, this sports watch provides you with high-end analysis reports of all your previous workout sessions – telling you the duration, distance covered, steps made, and calories burned during each and every exercise. With its massive 550mAh CR2450 button battery, this Bluetooth smart watch provides you with a stunning 2 years of usage time before its battery needs replacement – allowing you to enjoy all its health and fitness features throughout countless exercise sessions without needing to worry about running out of juice. 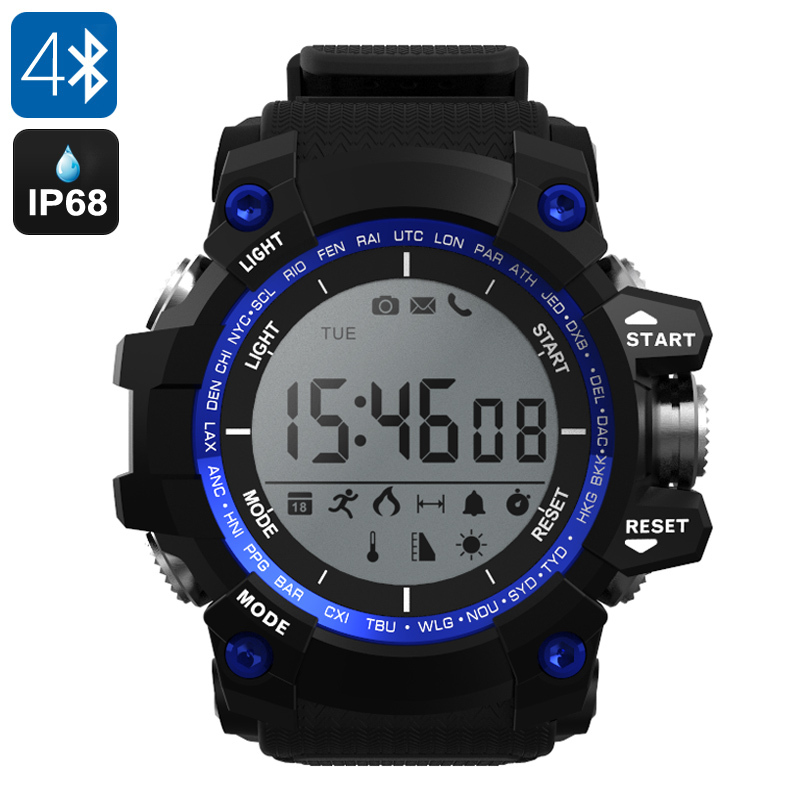 Besides its pedometer, this Bluetooth sports watch furthermore is capable of measuring UV levels, the current temperature, and altitude. Additionally, it also supports stopwatch and calendar features – making it a perfect multifunctional gadget that’s great for fitness, outdoor, and everyday-life purposes. Simply pair this Bluetooth watch with your smartphone, and you’ll be all set to enjoy its accurate exercise reports via the dedicated mobile application. Having all this data at hand allows you to analyze previous exercise sessions and furthermore lets you optimize all your upcoming workouts to gain the best possible results. Featuring an extremely tough and IP68 waterproof design, this Bluetooth outdoor gadget is resistant to water, dust, and drops. No matter how demanding life gets, this sports accessory will get you through the toughest of exercise routines and extreme sports sessions. Additionally, this smart watch also keeps you updated about the latest social media notifications, incoming phone calls, and received text messages – ensuring that you’ll never miss an important updated again. No matter where your next adventure will take you, with this Bluetooth smart watch, you’ll always stay up to date on the activities of your friends and family back home. The NO.1 F2 Bluetooth smart watch comes with a 12 months warranty, brought to you by the leader in electronic devices as well as wholesale electronic gadgets..
Scan QR code to download the phone app. Arabic: - مشاهدة بلوتوث - Chinese Simplified: - 蓝牙手表 - Czech: - Bluetooth hodinky - Danish: - Bluetooth Watch - Dutch: - Bluetooth Watch - French: - Montre Bluetooth - German: - Bluetooth-Uhr - Hebrew: - שעון Bluetooth - Hindi: - ब्लूटूथ देखो - Italian: - Orologio Bluetooth - Japanese: - ブルートゥース時計 - Korean: - 블루투스 시계 - Malay: - Bluetooth Watch - Norwegian Bokmål: - Bluetooth klokke - Romanian: - Ceas Bluetooth - Russian: - Часы Bluetooth - Spanish: - Reloj Bluetooth - Thai: - นาฬิกาบลูทูธ - Turkish: - Bluetooth Watch - Vietnamese: - Bluetooth Watch.